Since 2011, the two-piece grunge/post-grunge band Drenge has been touring the UK countryside. They already put out a 12-track debut there, one that is still finding its way stateside. Their break on this side of the pond came about late last year. Drenge had locked in spots opening for breakout bands like Radkey and Deap Vally and then played the iTunes Festival 2013 in London. Shortly after, their single Bloodsports was featured on advertisements for the television series Misfits. Although the release has been lagging behind several months, the single Bloodsports and its accompanying B-side Dogmeat have finally come ashore. If either track sounds familiar, it's only because both were mastered as part of a live iTunes Festival outtakes EP with five of the band's best aggressively crude and sometimes brooding songs. Bloodsports has given Drenge an auspicious entrance. 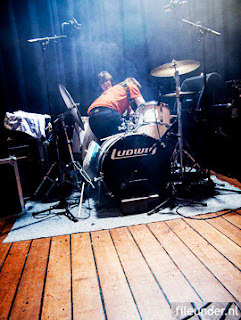 Consisting of Eoin Loveless (vocals/guitar) and his younger brother Rory Loveless (drums), Drenge originates from Castleton in Derbyshire but had more or less taken up residence in Sheffield. Like many two-piece bands, they aim to surprise people with a riotous stage presence that can be felt through the speakers. They like to deliver almost everything they play relentless and raw, without any redeeming qualities whatsoever. It's who they are and they make you believe it, with studio sessions that are as stark as their live sets. But it's not just the unbridled passion that makes the music they produce memorable. Drenge brings together grunge, blues, and sludge to make their own post-grunge sound. Bloodsports comes across like a post-breakup monotony song with the breakup lasting for a mere two lines. Then the track descends into a backup trance of sorts, filling time until she comes back or something better comes along. Who are you going to bet on? The verse is ferociously cold before drifting into its frenzied riffs. The lyrics are crisp and uncluttered, the instruments drone on and then explode. It makes for a great introduction of what is yet to come. The B-side (second on their debut alum) Dogmeat is equally callous. Although some people describe the sound as harsh, the music just rolls along. The angst is in the writing more than the delivery. Both Bloodsports and Dogmeat are among the earliest tracks laid down by the band. They wrote most of their material over a year and a half and recorded it chronologically. So the debut, due out in the States later this year, includes a self-contained evolution. The last tracks are newer. In listening to the entire album, there is a richness that grows out of the rawness. You can even hear some of it in the live iTunes exclusive. Those tracks include Dogmeat, Bloodsports, Nothing, Backwaters, and Fuckabout. (Backwaters was written before Nothing). The last track, Fuckabout, is surprisingly subdued, one of the best yet from the Loveless brothers. The lyrics are as sharp as anything they had written previously, but the composition captures the depth of their talent. It's one of my favorite songs and ensures a revisit when the debut LP is rereleased in the United States. Bloodsports/Dogmeat By Drenge Fire Up 8.8 On The Liquid Hip Richter Scale. Drenge keeps the surge of duo rock acts alive with two biting tracks from their debut album already out in the UK. With the band already in the studio laying down more material, expect a promising career from these uncompromising artists who were never looking for a career in music. Bloodsports/Dogmeat by Drenge can be downloaded on iTunes. The 5-track live session from last year's iTunes can also be downloaded there. You can also pick up a debut import from Amazon. They have a few shows lined up in the US before heading home the long way via Australia. Tour dates are listed on Facebook.